Q. Who do I make checks out to? Q. What kind of soccer shoes can I wear? A. All players must wear turf shoes or indoor shoes (flats)...NO Cleats! Q. Are there walls surrounding the fields? A. SISC has two fields with Outdoor Sized Goals and No Boards for out of bounds. 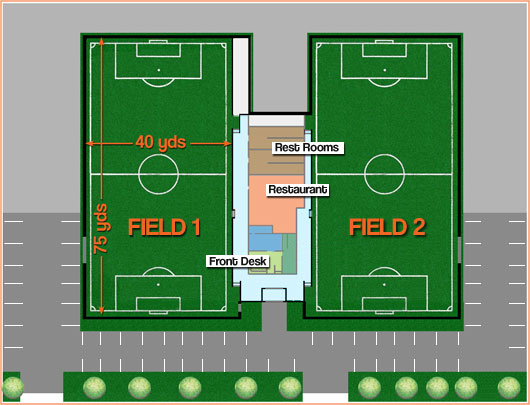 View the Facility Layout for more info. Q. What are the Facility Soccer Rules? A. Click here for a complete set of Soccer Rules and Regulations. SISC has two fields with Outdoor Sized Goals and No Boards for out of bounds. Two large digital scoreboards. Brand new lighting system and freshly painted walls along with new insulation on the goal walls. Both Fields feature Playfield Turf...feels and plays like real grass! All players must wear turf shoes, flats, or sneakers. Cleats and field turfs (both mold type bottoms) are NOT ALLOWED! !